We were driving down 17th in Denver (not 4th Street in San Raphael, CA, where American Graffiti was filmed.) Huh? Saw a pink building which immediately made me think of The Imaginarium of Doctor Parnassus. I was familiar with the building, I had been there before, and have seen it’s many incarnations over the years. In fact the building had quite a rep: it was jinxed, so to speak. Some also say that the place is haunted. Tony Pasquini says it. I saw the name Tony Ps and knew immediately this was another Italian restaurant by Denver pizza king, Tony Pasquini. Tony now operates a number of restaurants in and around Denver. We decided to stop even though we had to circle the block several times before we found a place just in front of the restaurant on E 17th. We went in, felt a good vibe and sat at a cozy table on the lower level. High back booths, Pasquiniesque inlaid tables: this one had gears, bottle-tops, and other assorted guy’s stuff sunk into hard resin-topped table tops. There was a view south across 17th. through a lot of glass and a – sort of yellow-hue Tuscan shadow thing going on on the other side of the room. I saw several very hip ladies of the staff walking about. Tony Pasquini is attracting some very hip people with this latest incarnation of the Tony Ps brand, formerly Pasquinis – not just staff, customers as well. We enjoyed a house, Happy Hour vino with bites of a Pasquini staple: soft, buttered pizza-dough twists served gratis, with a red dipping sauce, shaker-cheese and red-pepper-flakes. The cheese and pepper are up to you. Well we sat there enjoying the vibe for awhile. The indomitable Tony Pasquini stopped at the table and engaged us. We talked a bit about the old days; I remember him when he was just starting to bar-tend at the first Pasquini’s on South Broadway. I remember when it was The Pizza Queen. I was traveling in a motor home and would periodically check in to a small motel down the road a piece from the restaurant. I mentioned that several restaurateurs failed in this location, he countered that the building was also haunted. I had heard that. Tony introduced us to a nice couple who were planning a swing-dance event. It was cool, reminded me of Vegas’ Four Queens when they were doing Jazz upstairs. We signed off leaving an email address and left the premises. I’m sure we will come back. Did I feel so comfortable because this was my hood, or is it really that cool? Formerly, JR’s Bar & Grill as well as several others, like a New Orleans themed club, 777 East 17th Avenue has seen owners come and go as other venues seemed to click. There have always been rumors that the building is haunted. I’m bett’n that this is a hit; it will be one of Denver’s places to see and be seen this summer, especially with the upstairs bar, to say nothing of the second floor balcony overlooking 17th. Ave. It’s a Denver thing. Tony Ps serves excellent NY style pizza and classic Italian entrees and more. Click the website link for full menus. There are two bars and two levels of restaurant seating. We dined at my favorite Denver Italian restaurant the other night, and the dish we shared was the best we’ve had in years. Of course there have been several owners as well as different dishes served over the years, but this was – hands down one of the best. Ruby Trout dusted lightly with herbed flour and flash fried, served with garlic creme spaghetti. The huge (bragging rights) fish was filleted and laid out on a large plate in two fat pieces with golden garlic creme spaghetti filling the rest of the plate. I’m a red-sauce guy but this light, creamy beauty hugged the spaghetti in a perfect marriage with the fish ($13.75) including Homemade Minestrone Soup or House Salad, and bread. 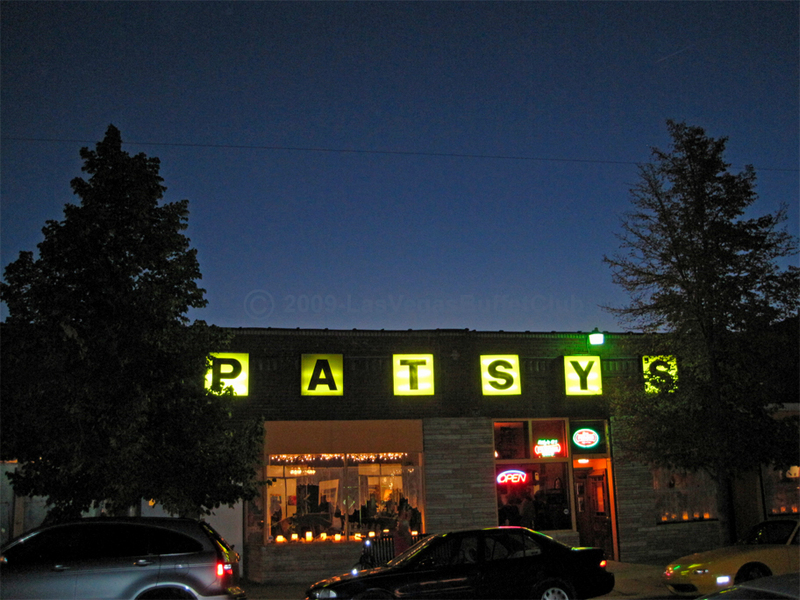 This may be a one hit wonder – we’ll see – though I might have to order my regular fav next time: Patsy’s big, fat homemade noodles with the garlicky red sauce served with balls or sausage, or one of each ($10.75) with Homemade Minestrone Soup or House Salad, and bread. Or we’ll try the Ruby Trout again hoping they can repeat perfection. There’s a new seats-you-at-a-table guy/barkeep at Patsy’s. He seems to be a good guy and adds high energy to the place; the downside is that the ice-cool and lovely, SB is no longer at the helm of the bar – a role she could have played in a Bogart film scene for scene. She will be missed. Tony Pasquini keeps hit ‘n ’em out of the park with another home run – his new Tonys Ps on 17th Street in Denver. Lodged in a deep groove of Denver hip, Tony P found a sweet spot with this uptown Dr. Parnassus-like Imaginarium/Restaurant/Hip Lounge.